Hi everyone! Winters calls for extra moisturization and nourishment. I don’t have excessive dry skin except for my feet but in winters even I have to take extra care else the skin appears scaly and dry. Body lotions become must have product during the winters to combat the skin dryness. 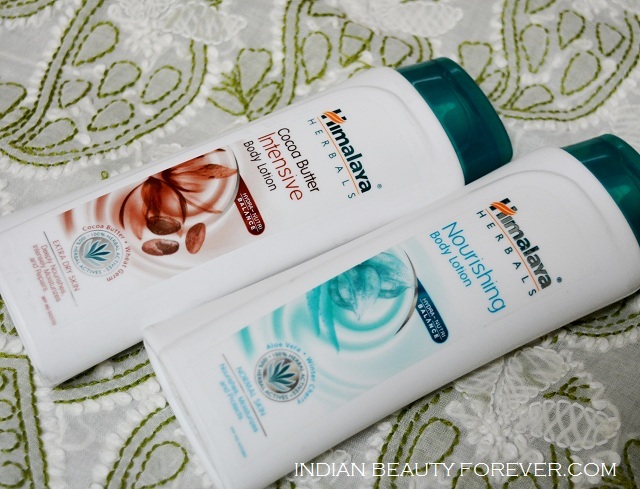 I will review the two new body lotions that have been launched by Himalaya herbals. 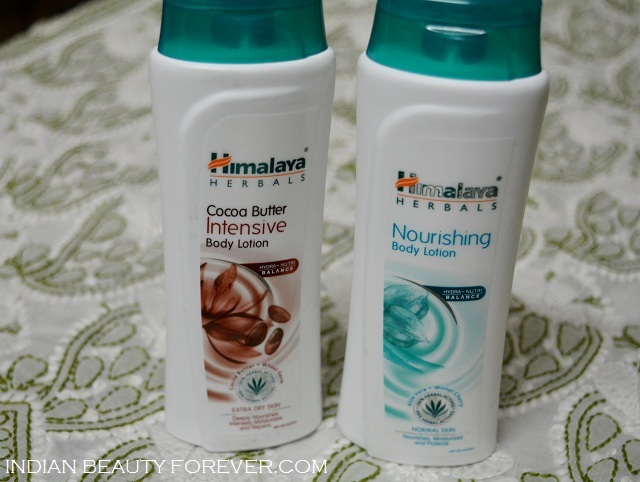 These are Himalaya Herbals Cocoa Butter intensive body lotion and Himalaya Nourishing body lotion. As the name suggests, it has a cocoa buttery scent and is formulated for extra dry skin. It has cocoa butter and wheatgrem oil that is enriched with vitamin E to hydrate, nourish the dry skin in winters. I like the sweet smelling coco scent of this body lotion. It keeps my skin hydrated throughout the day but my mum who has very dry skin, for her this lotion works for 4-5 hours after which she needs to apply again. My feet are very dry and I like to use this variant for my legs and feet. It keeps the dry skin hydrated. Price wise this is a good to try option. If you don’t have a problem with the cocoa butter scent then these are very good and affordable option. I have used a couple of cocoa butter body lotions but the scent of this body lotion is something that I have liked more than the other brands as it is mild and not too over the top. This variant is formulated for normal skin and has a floral subtle fragrance. I like to use it for my body as my skin isn’t too dry and this being ideal for normal skin, keeps the normal skin moisturized decently throughout the day without being too greasy. Both the body lotions have a user friendly, travel friendly convenient to use packaging. they are reasonably priced and are good for the moisturisation in winters. Take: I will recommend cocoa butter one to those of you who have dry skin and the other one for normal skin who don’t need the extra moisture that could make the skin greasy in return. For very dry skin, moisturization will be required.